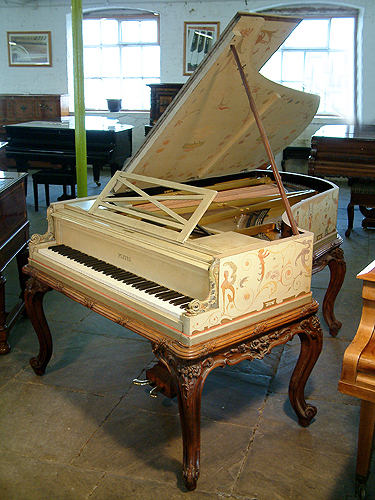 If you are interested in this Pleyel grand piano, give us a call on 0113 244 8344 and ask for Steven Leeming who will be happy to discuss your requirements. 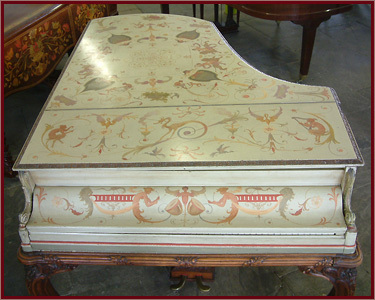 Unique, Hand-painted, Pleyel Grand Piano Signed by Georges Meunier. 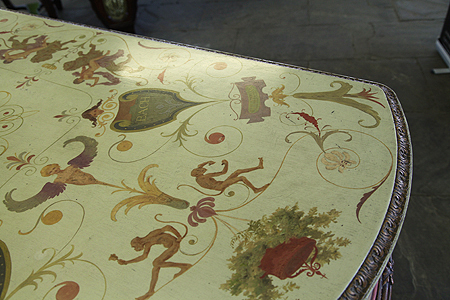 Hand-painted with a fairies, satyrs, nudes, monkeys, mythical creatures, birds, flowers and crested composers names. 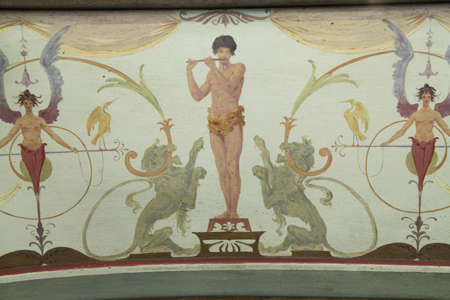 A unique Pleyel grand piano hand-painted with a fairies, satyrs, nudes, monkeys, mythical creatures, birds, flowers and crested composers names. 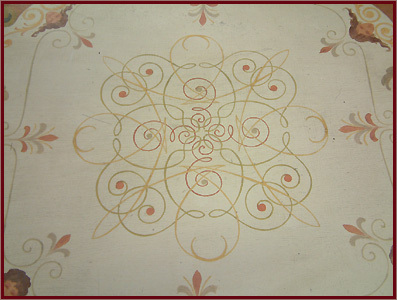 Signed by G. Meunier. 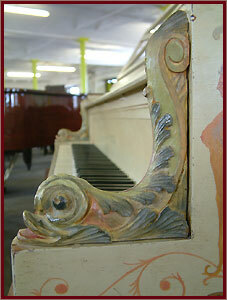 Interesting carved fish on piano cheeks. 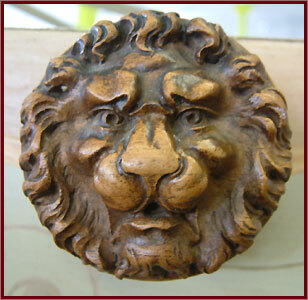 Carved lions head on lid lock. 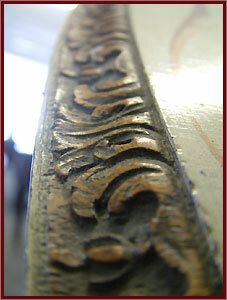 Carved bevelled edge on lid. 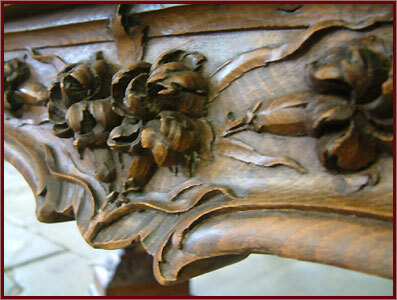 Piano case sits on ornately carved french walnut frame, carved with foliage and flowers. 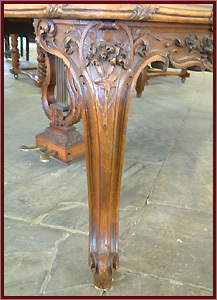 Piano has six cabriole legs with scroll feet.Instrument has been restored. Georges Meunier (1869 - 1942) was an eminent french poster artist. He worked under Cheret at the Chaix print house in Paris where he produced more than 50 original posters advertising products and parisian events. His works are now considered iconic and reflect a golden era of french poster art. 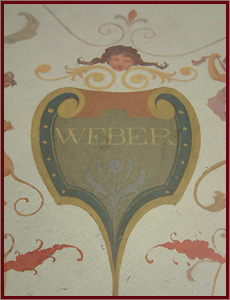 Meunier was born in Saint-Cloud, France in 1869. As a young man he moved to Paris and studied at the National School of Fine Arts and studied under Joseph-Robert Fleury. Later he attended The School for the Decorative Arts where he trained in both classical and modern design. Meunier started work at the Chaix print house in 1894 working under Cheret, the founder of the advertising poster movement. 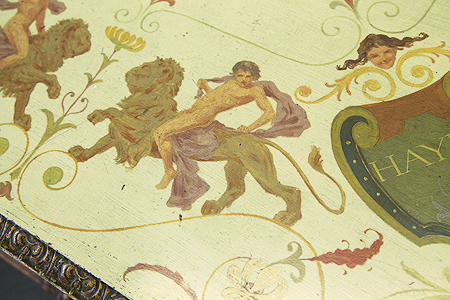 He drew his posters directly onto lithographic plates. He stayed until 1898. During his time there he designed 44 to 56 dated posters. 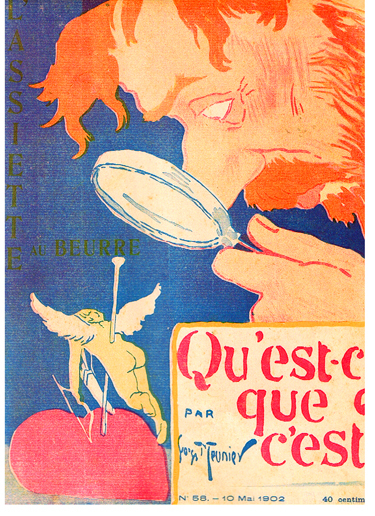 Meunier became well known in Paris, his posters were exhibited in salons across the city. 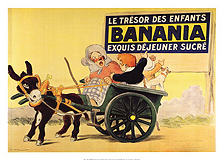 His works including the memorable "Banania" and "Job Cigarette Papers" posters are now considered iconic and reflect a golden era of french poster art. 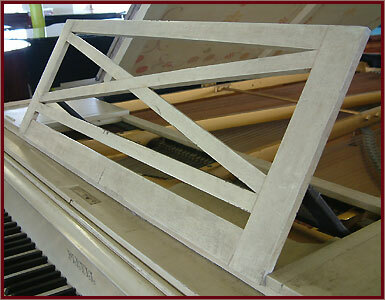 According to Pleyel company records this piano left the workshop in August 1893 and was sent to 46 Rue Rivoli, Paris. 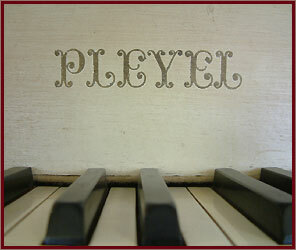 Ignaz Pleyel originally a publisher of music, began building pianos in 1807. 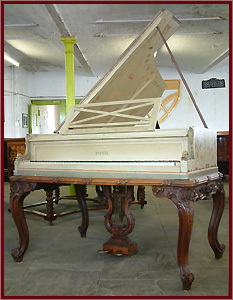 Notoriously Pleyel pianos were played by Chopin. 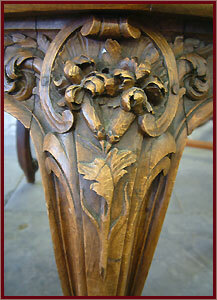 Description: Case sits on intricately carved, cabriole legs. 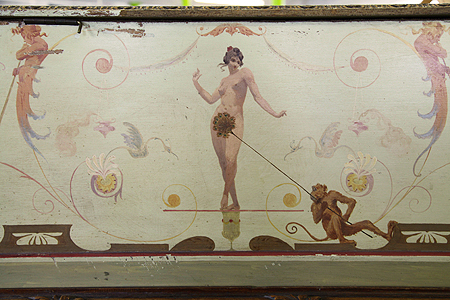 Case hand-painted with fairies, satyrs, nudes, monkeys, mythical creatures, birds, flowers and crested composers names. Signed by G. Meunier. 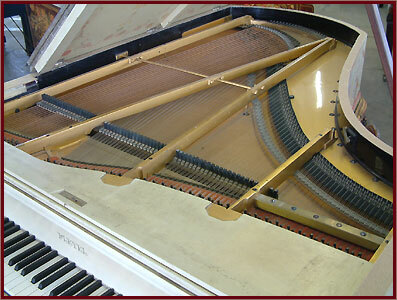 Instrument is restored. 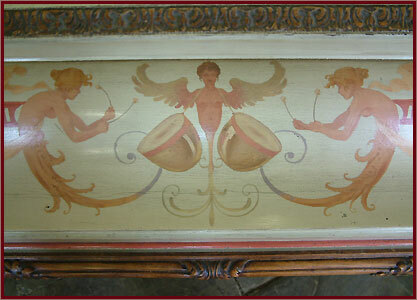 Art cased, Pleyel grand piano hand-painted with a fairies, satyrs, nudes, monkeys, mythical creatures, birds, flowers and crested composers names. Signed by G. Meunier.